It's a path ingrained in us: Go to a university right after high school and graduate in four years. But that couldn't be further from reality. And until education leaders take that into account, too many students will lose out. The fall after I graduated from high school, I took the traditional path. I entered a competitive, private four-year college, and four years later, I earned my bachelor's degree from that same institution. When I think of the route my children might take after high school, I can't help but picture something that looks a lot like the one I took. That makes me part of the problem with higher education today. If you randomly stopped 100 adults and asked them to raise their hand if they had received their BA, and done so four years after graduating from high school, guess how many would? I guarantee your estimate would be too high. By a lot. A while back, Gerald Chertavian, a successful businessman turned education reformer, posed that question to a gathering of 400 education officials and public-policy people at a New England Board of Higher Education summit. When he asked who in the crowd had a college degree, just about every hand in the room went up. When he asked how many had earned that degree four years after high school, about 80 percent of the hands stayed up. Then he lowered the boom: All these people charged with shaping education policy were far outside the mainstream. Census data from 2005 tell us that only 28 percent of American adults have a bachelor's degree. As for how many adults took the "traditional" path and received their BA within four years of high school, some rough number crunching of federal education data shows that the percentage dips to below 10 percent. By definition, that's no longer traditional. It's radical, and it makes you wonder why we still call them four-year colleges. Why are our perceptions so out of step with reality? Probably because the old path still dominates at name-brand private colleges, and they continue to be the prism through which so much of higher education is viewed. "American elites, whether in education, politics, business, or the media, tend to focus on a small number of elite institutions and ignore the large number of institutions where the vast majority of college students are enrolled," says Terry Hartle, senior vice president of the American Council on Education, a higher-ed advocacy and research group based in Washington, D.C. "We tend to underappreciate the complexity and diversity of higher education." True, the four-year graduation rate -- regardless of student age -- is higher at private colleges (54 percent) than public colleges (32 percent). And the rate climbs a good deal higher at elite private schools. But to get an idea of scale, consider this: If you add up the undergraduate students at all of the Ivy League colleges, you get about 60,000. Then compare that with the roughly 40,000 undergraduate students just at Ohio State University's main campus. Or the 6.6 million students in community colleges across the country. Hartle knows this as an education leader who's spent years sifting through data. And he knows it as a dad whose daughter spent three years at a community college before transferring to Northeastern University. Today's truly "traditional" path is a goulash of enrollment patterns -- frequent starts and stops, serial transfers, and oscillation between full- and part-time student status. People who study enrollment even have a term to describe these circuitous routes that students are increasingly taking, such as hopping from a two-year college to a four-year college and then back to a two-year college, with a couple of timeouts in between. They call it "swirling." Fluidity is the defining characteristic of today's college student. Things promise to get only more fluid as the recession forces more people to consider lower-cost alternatives like community colleges and part-time status. But our rigid higher-ed system fights with this fluidity, making it hard for many students to adapt to college life and making the transfer process more complicated than it needs to be. The cost is lost credits, time, money, and opportunity. The fact that transfer students are typically not counted in federal graduation-rate data only strengthens the argument that public policy is operating from a distorted sense of reality. President Obama has vowed to lead the nation toward having the world's highest proportion of college graduates by 2020. Depending on what stats you look at, that could be quite a climb. Right now, we clock in at the 10th spot, and we have one of the highest college dropout rates in the industrialized world. But we'll have a much better shot at getting to the mountaintop if we stop thinking there's just one route leading us there. The floors creak in the five-story tan-brick building in Downtown Crossing, but the place crackles with energy. It's the site of Year Up, a one-year post-high school intensive training program for urban students, many of whom barely made it through high school. In what amounts to a 13th year of education, the students spend six months in small classes, learning technical skills as well as social skills for succeeding in the business world. Then they spend the next six months working in paid apprenticeships at companies like State Street, Putnam Investments, and Partners HealthCare. If all goes as planned -- and the program's rigorous performance data indicate that it usually does -- the students finish the year with valuable experience, a decent wage, up to 18 college credits from Cambridge College, and heightened preparation to either enroll in college full time or take a permanent position with the company where they apprenticed, making an average of $30,000 a year and receiving benefits like healthcare and tuition reimbursement to continue their studies part time. Chertavian started the program in Boston in 2000, the year after selling the telecom company he cofounded. With his Harvard MBA, he sets the business tone for the students -- crisp suits, firm handshakes, ready smiles. Year Up has now expanded to New York, San Francisco, Washington, D.C., Providence, and Atlanta, with new outposts planned for other cities in coming years. Despite this success, Chertavian grew dejected when he did the math one day not long ago and realized that even if Year Up continues to expand at a good clip, it will never be big enough to make more than a dent in the 4 million-strong ranks of young people who find themselves with few options after high school. So he's turned his attention to trying to change policy at the national level while continuing to expand Year Up at the grass-roots level. Nationally, he envisions a phalanx of innovative postsecondary programs like his, designed to be "stackable" -- that is, easily combined with two- and four-year colleges to help students get the training and credentials they need. He's also taking aim at the default setting that so many employers insist on -- using a bachelor's degree as the primary screening tool when hiring. That, he says, has got to change in the stackable world he's working toward. For a long time, the push has been to get as many students as possible to college, in the hopes that the higher-education system would buff out the gross inequities marbled into our K-12 schools. That's not enough. If students enter college academically and socially prepared, they're far more likely to do well and graduate. So we need to do more to get them ready while they're still in high school. And once they get to college, we need a system that allows easier movement between schools, so they don't lose lots of ground if things don't go as planned at their first stop. I've gained new appreciation for this in the last couple of years. While researching and writing a book, I got to know many graduates of Boston Public Schools who made it to college, only to find themselves unprepared once there -- whether academically, financially, or socially. Then they dropped out. I've gotten to know more of them through a small scholarship and mentoring program that some friends, community members, and I created last year (the Alray Taylor Second Chance Scholarship) to help this type of student return to college. A comprehensive tracking study released last fall found that two-thirds of the Boston public school students who went on to a two- or four-year college had failed to get any kind of degree within seven years of graduating from high school. It's startling how easily students can get off-track. Many drop down to part-time status simply because they can't afford to pay the healthcare premium required of full-time students. Others leave college over squabbles with schools over bills they say were paid or credits they were told would transfer but didn't. And way too many have gotten saddled with heavy debt, often at private schools with less-than-stellar reputations. When I first entered this world, I assumed these students with bumpy post-high school paths were the outliers. The real shame is how mainstream they are. Tishia Reeves is mainstream. When she graduated from Boston English High School in 1999, she had college options. But she wasn't sure what she wanted to study and wasn't ready to take on a lot of debt. So she got a job as a medical receptionist. 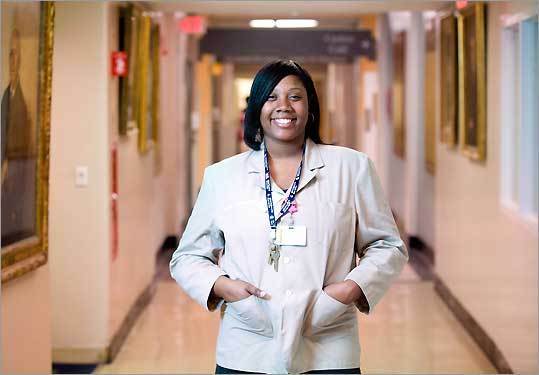 A decade later, she had advanced to a referrals coordinator position at Beth Israel Deaconess Medical Center, helping patients and providers navigate the maze of healthcare paperwork. But recognizing the limits to her career growth without a college degree, she enrolled at Bunker Hill Community College in January. These days, Reeves is nothing but serious about college and won't be satisfied until she's earned not just a bachelor's degree but also a master's. Instead of easing into her college experience, she took a full raft of five courses this semester, which forced her to drop from 40 hours a week at her job to 36, at a cost of about $100 a week in reduced salary. She doesn't receive any financial aid and doesn't need to check any notes to tell you exactly how much she spent on tuition and fees ($1,740) and books ($550.56) this spring, and how much she's already ponied up to take five more courses this summer ($1,892). Like a returning GI from the front lines, she knows how much more mature and mentally prepared she is for college now that she's 27. Still, what's ahead of her is daunting. And she admits to feeling despair when she heard about state budget cuts that might lead to fee hikes. Those could derail her college journey before it's had time to build momentum. "Tishia, you picked the wrong time to go back to school," her father told her. "Daddy, there is never a wrong time to go back to school," she shot back, suppressing fears telling her that he just might be right. Her 56-year-old college writing instructor, Wick Sloane, urged her and her classmates to do more than idly complain. Sloane owns the definition of an elite educational pedigree -- Phillips Exeter Academy, Williams College for undergrad, Yale for his MBA. He went on to serve as chief financial officer for the University of Hawaii system. But for the last couple of years, he's found his niche: teaching entry-level writing classes at Bunker Hill while advocating for colleges outside the elite club that handed him diplomas. "The noise is about so few places," he says, "and those places aren't trying to be leaders. They're the ones who've created the vision that you have to pay 50 grand a year to get a good education. But for these community college students, a hike of 10 or 15 bucks a credit could change the course of their lives." At Sloane's suggestion, Reeves crafted a letter on behalf of the class and sent it off to the state commissioner of higher ed, Richard Freeland. "Many of our classmates are single mothers, ESL students, and Armed Forces veterans," she wrote. "We are working adults with full-time jobs and responsibilities with all the trimmings. The graduation rate here is well below the national average for exactly these reasons. The state must find ways to improve our opportunities, not threaten our resources with budget cuts." Then she asked the commissioner to come speak to her class, noting that it meets at 7 a.m. on Mondays and Wednesdays in "room D119. You have to go through the computer lab D105. I can meet you inside the main lobby, just behind the revolving doors." Freeland replied, sending his senior deputy commissioner, Clantha McCurdy. So there she was, at 7 a.m. on a Wednesday in mid-April, sitting in a basement room with cream-colored concrete walls, listening intently to Reeves and 15 of her classmates. McCurdy said she sympathized with their predicament even if she had no easy answers. Reeves asked her straight out: "A lot of students are cutting back on credits because of the economy. Will the higher-ed office take a look at doing more for students taking longer than four years to earn their degree?" McCurdy said resources were strained, but she allowed: "Maybe it's time to put more money into programs for part-time students." Later, when McCurdy made a pitch for the state's joint admissions program, designed to allow students to move easily from a community college to a four-year state school and to receive tuition discounts, one of Reeves's classmates cited problems with the program. Those tuition discounts disappear after two years. Given complications involving credit transfers and major requirements, she told McCurdy, it would be impossible for her to finish her degree within that time frame. Still, Reeves and her classmates emerged from the meeting a bit more hopeful. At least someone with influence was making an effort to understand their reality. A big part of grasping that reality is realizing that it's not limited to low-income students. Earlier this month, Terry Hartle took a break from his education-policy work in Washington to travel to Boston to see his daughter collect her degree in marketing from Northeastern three years after transferring there. At 24, Allison Hartle was older than most of the friends she was graduating with, but she had zero regrets about having spent three years at a community college figuring out what she wanted to do. "The traditional path is painted as being the proper thing to do, that if you don't take it you've somehow failed," she says. "But that's not true. I know a ton of kids who went off to college and wasted their parents' money. I don't think I wasted anything." Neil Swidey is a Globe Magazine staff writer. E-mail him at swidey@globe.com.